Unchained melody : for orchestra / Graeme Koehne. Instrumentation: 3 flutes (3rd doubling piccolo), 3 oboes, 3 clarinets in B flat, 3 bassoons, 4 horns in F, 3 trumpets in C, 2 tenor trombones, bass trombone (doubling tuba), percussion (4 players), piano, strings. CD: Inflight entertainment / Graeme Koehne. 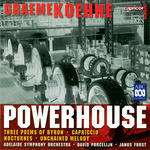 CD: Powerhouse / Graeme Koehne. CD: Orchestral works / Koehne. - Book: Meet the music . Teaching kit 2 / [compiled by] Brett Johnson.